The Mekong Restaurant takes you on a delightful tour of all the places touched by a beautiful river. 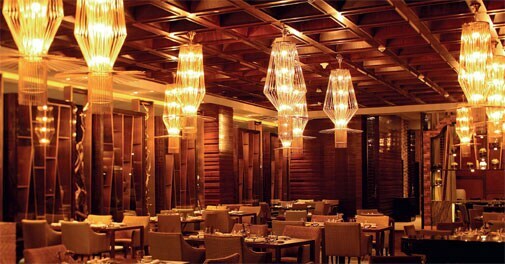 Deeply soothing tones of copper and mahogany welcome you into the restaurant. IN A CITY WHERE LOUNGES AND BARS mushroom with amazing regularity, the Li Bai Bar and Mekong Restaurant - with deeply soothing tones of copper and mahogany and 37th floor views of central Mumbai - come as quite a relief. There is a South East Asian influence on everything in the establishment, right from the food and alcohol (some of which comes in mason jars) to the ambience. While cinnamon, star anise, ginger, plum and lemongrass is used copiously in their drinks, Libaitinis - house martinis made of baby chrysanthemum - are a treat to the senses. A well-stocked bar of regulars and classics, on the other hand, helps in the creation of smoke-infused cocktails like Spring Wind as well as others like Smoking China and Fog & Mist. The menu at the restaurant is classified into Chinese, Vietnamese, and Thai, with food derived from every region the Mekong river flows into. While their Thai section - which has a measly selection of basic curries - is nothing to write home about, their Vietnamese and Chinese menus are brief, varied and cleverly designed. And, amazingly, some of their best dishes are the simplest - the prawn dimsums with a chilli oil dip, crispy squid with salt and pepper, and marinated shredded chicken with coriander, chilli and lemon juice - reflecting a basic faith in the ingredients. 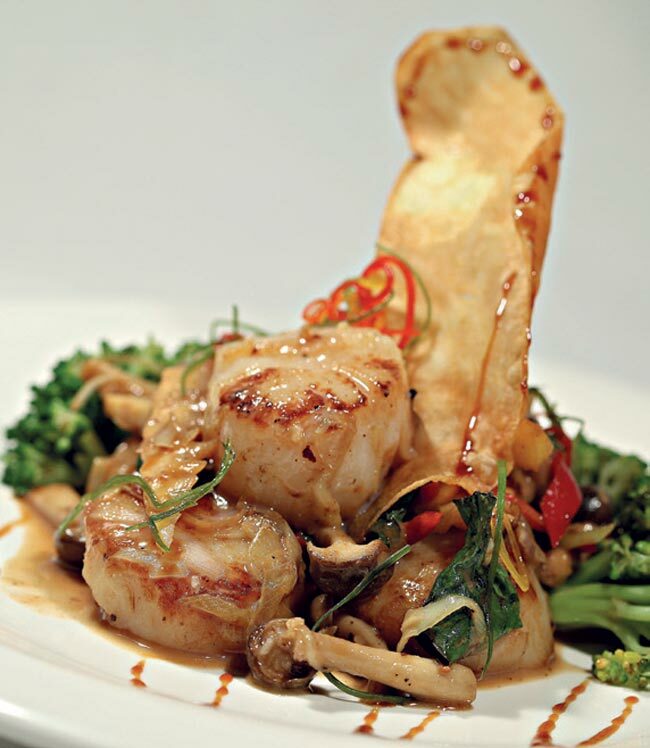 Pan-seared scallops with mushroom, green asparagus and chilli sambal. The Vietnamese section was the most exciting of the lot, complete with crispy rolls stuffed with shrimp, crabmeat, shiitake mushrooms, glass noodles and fish sauce. Spicy green beans sauteed with tofu and chilli and lotus-leaf steamed fried rice with chicken and shrimp, turned out to be interestingly loaded bites. The two pork dishes on the menu - steamed sliced pork belly and sliced pork with vegetables - appeared in the Chinese section, and they were interesting options indeed. Desserts were not up when we went, and the ice creams did not excite, but we will give them a shot once the restaurant has had a little time to settle in. The perfect place for a beautiful Oriental evening.